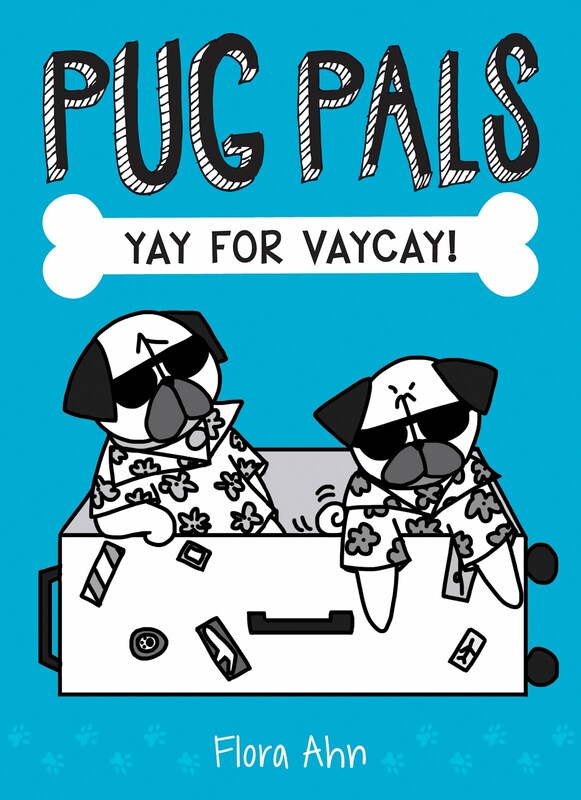 Bah Humpug: Book Deal Announcement! I have some really exciting news that I wanted to share here on this blog, even though I've already made announcements on my social media accounts. 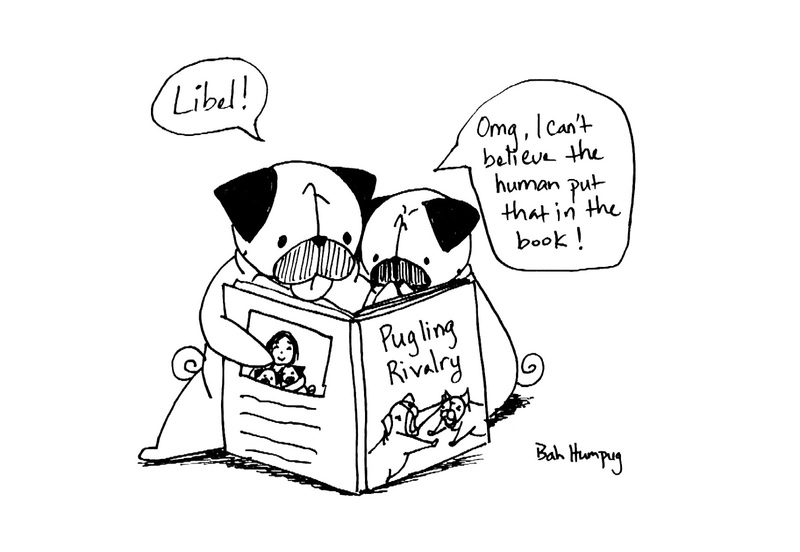 Scholastic will be publishing two of my Pugling Rivalry books in 2018! 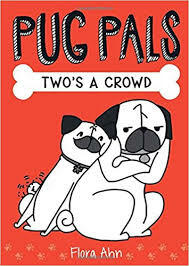 Both books will be illustrated chapter books geared for children, but of course they can be enjoyed by all ages as the love of pugs has no age limit. The story will follow a mostly fictional account of Sunny's and Rosy's sibling rivalry adventures. And I know what you're wondering and yes, there will be plenty of drumstick attacks in the books. I know 2018 seems like forever away. It feels like that for me too! But, on the other hand, I'm grateful for the time to work on these two books as they'll involve a lot of illustrations. A LOT. The official announcement can be found in Publishers Weekly with a photo of me (I know, I know. I'm no longer anonymous). I tried submitting a photo of the pugs instead of me, but that didn't fly. The first book will be coming out in spring 2018 and the second one will be coming out in fall 2018. The deal is for two books, but if these two do really well then future books in a continued series could be a likely outcome. And doesn't the world need more pugs and, specifically, more Sunny and Rosy? I'll continue to post my drawings here on this blog, but both real work and now book work has been taking up a good amount of my time. I'll also post some progress posts on my social media accounts if you want to discover this process with me because all of this is so new and exciting and terrifying for me! Thank you to everyone who visits this blog and for your continued support. It's been a long and interesting journey! For the sake of nostalgia, look at how much my drawing style has changed from my first post here on Bah Humpug. My pugs have definitely gotten "fluffier" since then. So cool! I cannot wait!! So excited for you. I look forward to your posts every day when I am on Facebook. I sometimes even look at all your pictures more than once! I love your pugs and your witty sense of humor you have about them! You are truly and awesome lady and lover of pugs. Thank you for all you do and for sharing your pugs and life with us!! Congrats! You are inspiring to a hopeful writer! You so deserve this! Your drawings are inspirational and heart warming. You can imagine them there in eaxh drawing. I have an older shaved black peke that has the same mannerisms, it is a pleasure to read along your journay. I am thrilled ! When can I order ? Please be fearless ! I so think you are an amazing talent ! And you should too , because I am rarely wrong ..